"Ba Ba Blue Sheep", won 2nd place award at the Dinnerware Museum, Ann Arbor, MI show called "The Art of High Chair Fine Dining". The set is now part of the Dinnerware Museum's permanent collection of children's dinnerware. 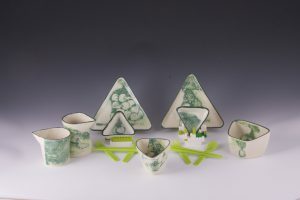 The set is based on a triangle, with nesting pitchers, plates, bowls, and cup. I often display it using LEGO bricks. This Turtle Dinnerware won an Honorable Mention prize at the Providence Art Club show, Providence, RI, in March 2015. 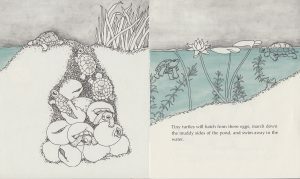 The Turtle images are my copyrighted work for a book I illustrated by Millicent Selsam called "All About Eggs". The book is now out of print, but my illustrations are getting a new life on dinnerware for children. 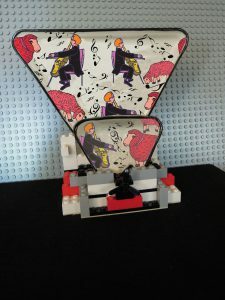 I often display them with LEGO bricks to add to the fun for children. 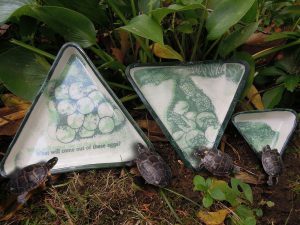 These Turtles images are copyrighted work for a book I illustrated by Millicent Selsam called "All About Eggs". The book is now out of print, but my illustrations are getting a new life on dinnerware for children. A Turtle page, copyrighted work by me for a book I illustrated by Millicent Selsam called "All About Eggs". The book is now out of print, but my illustrations are getting a new life on dinnerware for children. They are often shown with LEGO brick supports for fun. Illustrations I often do at concerts will sometimes find there way onto my dinnerware. I'm an amateur singer/musician myself and I'm always interested in the performing arts, another passionate pursuit. I enjoy singing in a Swing Band and a Classical Choir as well. 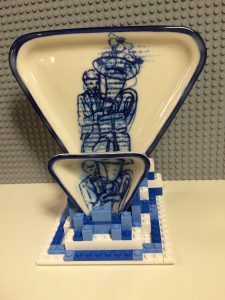 Dinnerware is often shown with LEGO brick supports for fun. 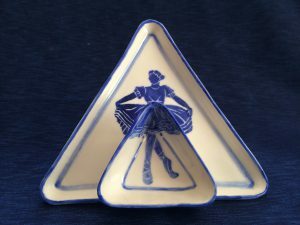 This Ballet Dancer, is shown with the triangle small bowl placed where her legs and feet are on the triangle plate. It's made with a paper silhouette of the figure. Once the shape is cut out of a sticky back paper, I can make a silkscreen of her and then print the image onto porcelain directly or onto decal paper. I'm always interested in the performing arts, another passionate pursuit. 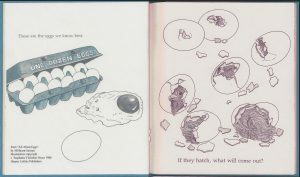 A hatching chick page, copyrighted work by me for a book I illustrated by Millicent Selsam called "All About Eggs". The book is now out of print, but my illustrations have been inspiration for making 3D architectural ceramic pieces. And I'll use these images on my dinnerware for children. 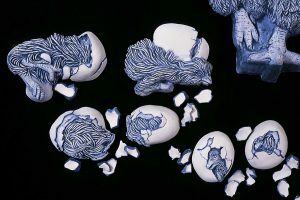 Hatching Chicks in ceramic from images copyrighted by me from a book I illustrated by Millicent Selsam called "All About Eggs". The book is now out of print, but my illustrations have been inspiration for making 3D architectural ceramic pieces. These hang on a wall. 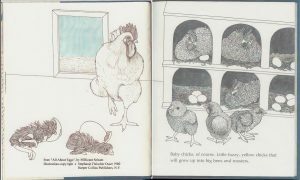 Rooster, Hens and Chicks pages, copyrighted work by me for a book I illustrated by Millicent Selsam called "All About Eggs". 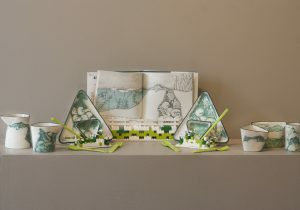 The book is now out of print, but my illustrations have been inspiration for making 3D architectural ceramic pieces. And I'll use these images on my dinnerware for children.